Plato’s Symposium is arguably the most memorable philosophical work ever written on the subject of love. It is also the inspiration for Leonard Bernstein’s gorgeous violin concerto, the Serenade. 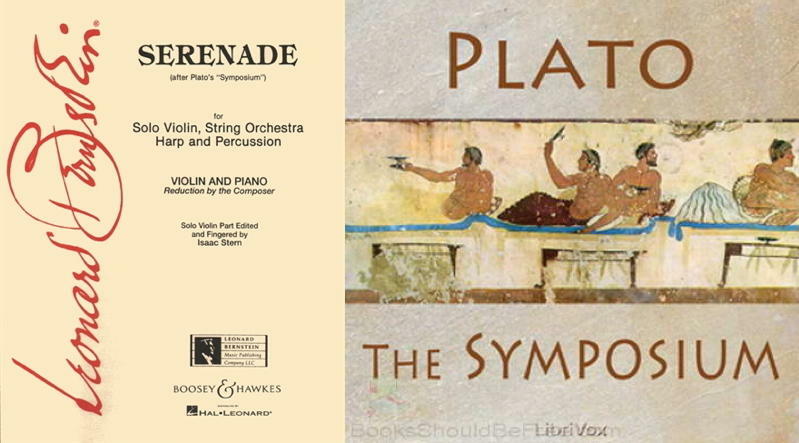 What would Plato think of Bernstein’s Serenade, especially given his criticism of art and poetry? Is Bernstein more interested in what one of Plato’s drunken characters calls “vulgar love”? Or is he inspired by Platonic love – the highest form of love? How does Bernstein explore these themes through his music? John and Ken talk to Brandi Parisi from All Classical Portland about love – its nature, its origin and its purpose – and music. The taping will be held at Vancouver’s Skyview Concert Hall on Sunday, October 4 at 4:30 pm, prior to Ms. Meyers’ appearance as guest artist with the VSO. Ticket are $15 exclusively for the taping, or $10 with a ticket for either the Saturday or Sunday concert and available now at the VSO website. Skyview is located at 1300 NW 139th Street in Vancouver, Washington.